Vitakraft Australian Cockatiel and Food offers the same variety of nutrition found in the Australian steppe and savannah, such as seeds, eucalyptus leaves and many different types of millet to ensure that your parrot receives everything they need. Cereals, Seeds, Fruits (4%), Eucalyptus (1.5%), Minerals, Cactus flowers (0.5%). Cereals, Seeds, Derivatives of vegetable origin, Fruits (4%), Honey, Vegetables. Cereals, Seeds, Honey (0.5%), Eucalyptus (0.6%), Sugar, Fruits. Cereals, Seeds, Derivatives of vegetable origin, Minerals, Fruits (0.6% kiwi), Sugar, Honey. Vitamin A 8000 iu, Vitamin D3 900 iu, Vitamin E 50 mg, Vitamin B1 4.0 mg, Vitamin B2 6.0 mg, Vitamin B6 6.0 mg, Vitamin B12 10.0 µg, Biotin 250 µg, Niacin 50 mg, Pantothenic acid 20 mg, Nicotinic acid 22.72 mg, Copper 8.0 mg (as copper (II) sulphate-pentahydrate, Iodine 0.4 mg (as calcium iodate, without water). Vitamin A 8728 UI, Vitamin D3 873 UI, Vitamin E 78mg, with colourings and preserviative EC approved additives. Vitamin A 8728 UI, Vitamin D3 873 UI, Vitamin E 78mg, with colouring and preservative EC approved additives. Vitamin A 8500 UI, Vitamin D3 850 UI, Vitamin E 77mg, Vitamin B2 8mg, Vitamin B6 8mg, Vitamin B12 20mcg, with colourings and preserviative EC approved additives. Approximately 25 - 30g (2 - 3 tablespoons) per bird per day. 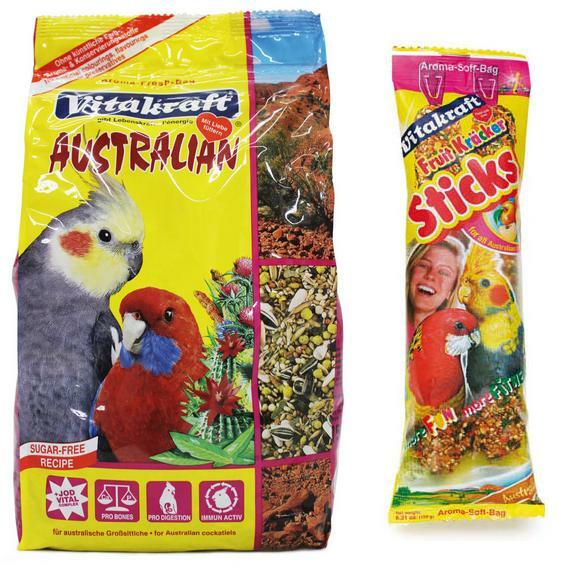 There are currently no questions for Vitakraft Australian Cockatiel Bird Treats & Food - be the first to ask one!